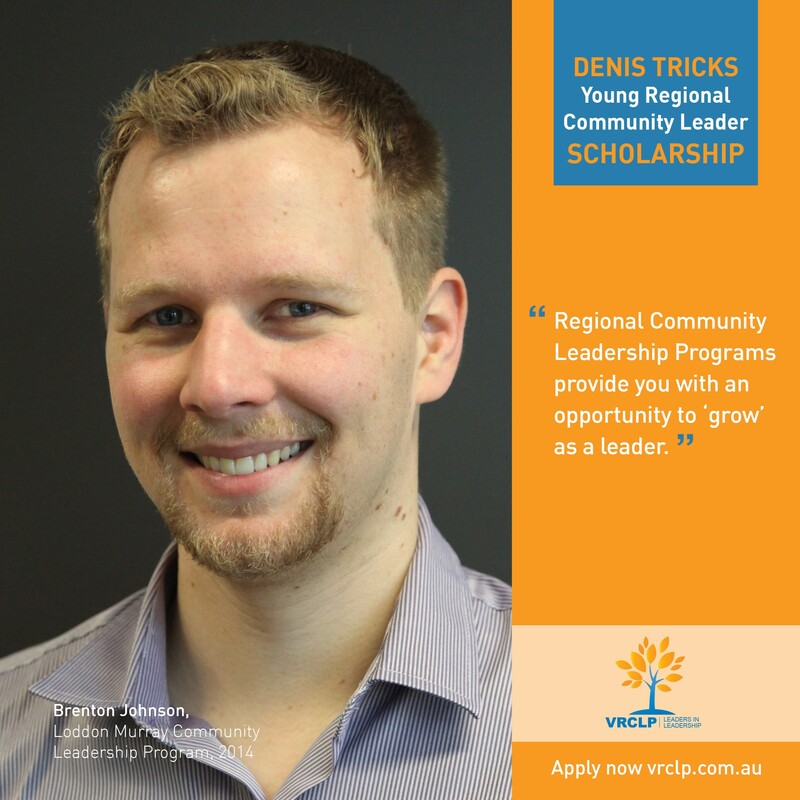 The Denis Tricks Young Regional Community Leader Scholarship was established in 2015 for a young person aged between 21-30 who is able to demonstrate leadership potential to participate in an experiential learning program. The scholarship enables a young person to enroll in one of the 10 Regional Community Leadership Programs operating across Victoria. The aim of these programs is to build skills, knowledge, confidence and networks. The programs are challenging, confronting and literally life changing. The diversity of employment and life experience, challenges their values, focuses their learning about leadership and forces them to think I've the organisation they work in. It allows young and emerging leaders who care for their community to make a difference, enabling young people to be connected to the people that lead and influence our communities across rural and regional Victoria. Young participants meet like-minded people and make rewarding new friendships that span beyond the program year. The Programs offer an experiential learning opportunity that will not only help them progress their career but to provide them with the capacity and capability to make a difference in their community. 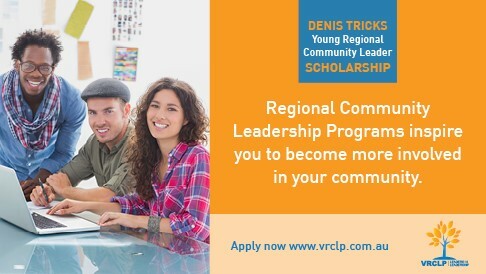 Being awarded the Denis Tricks Leader Scholarship allows the recipient to enroll in their local Regional Community Leadership Program, across Victoria. There are 10 Leadership Programs currently operating: Alpine Valleys Community Leadership Program, Fairley Leadership (Goulburn Murray), Gippsland Community Leadership Program, Leaders for Geelong, Leadership Ballarat + Western Region, Leadership Great South Coast, Leadership Wimmera, Loddon Murray Community Leadership Program, Northern Mallee Leaders, Rivers & Ranges Community Leadership Program. Leaders who graduate from these programs have a common commitment to making a difference within their communities. Using their new found skills and knowledge they not only prosper in their careers but they are contributing to making their communities viable and sustainable. With over 3000 graduates across regional Victoria alumnus contribute approximately $30 million per annum in voluntary activity and over 1300 community organisations are directly benefited. The Regional Community Leadership programs operate ‘in a region, for a region’ and over a minimum 12month period expose participants to an experiential learning program that reflects the needs of their region. Through structured workshops, guest speaker presentations, field trips and events program participants are introduced to key issues and decision makers in their region, state and nation that encourage them to develop and explore their own learning and leadership styles in a supportive environment. Program participants come from all walks of life and have a diverse range of life experiences. They could be existing leaders wanting to grow their effectiveness or new and emerging leaders who want to make a meaningful contribution to their community. “I undertook the Gippsland Community Leadership Program in 1999 and it changed my life and my professional outlook. Soon after I moved to Victoria’s North East and joined the board of the Alpine Valleys Community Leadership Program. Both gave me a regional perspective and helped me understand how communities across the region were grappling with the challenges of the time. I learnt about the value of collaboration and co-operation. Innovation is critical to the future success of our regions and we all have a role to play embracing new ideas and networks.” Ken Lay, Chief Commissioner of Police – Victoria(Ret). I’m nearly half way through the Northern Mallee Leaders (NML) program and my leadership journey, and already I feel like I have learnt so much. I’ve been given amazing opportunities and met people I can now call friends. The program days have been travelling along well. We’d heard from a range of speakers and learnt a mountain of information. Our May program day focused on Regional Economy and Tourism. The only difference to this day was that I was part of the Duty Team. The role of the duty team is to ensure the program day runs smoothly. Speakers had to be confirmed, details needed to be sent out to the group, a group reflection had to be run… the list goes on! The experience of being in the Duty Team was eye opening. It’s easy to observe everyone’s leadership qualities, but it can be a little confronting to step up and show your own style. It is one of the reasons why I am doing this program though –to define my own leadership style. Receiving the Denis Tricks Young Regional Leader Scholarship in 2016 has already meant a lot to me. Being involved in the 2016 Gippsland Community Leadership Program (GCLP), where everyone is an equal no matter what you do or where you are from. I am the youngest in the program, and it has been great to be able to network with such a diverse group as well as establishing new friendships and networks. The program also allows me to experience and explore our region and consider the issues and opportunities that we face - after all Gippsland is a great region in which to live and work. I am constantly developing my own leadership skills and knowledge and achieving a greater sense of self reflection and awareness, because I was a 2016 Denis Tricks Scholarship recipient. Thank-You everyone for your generous support. This will go towards funding 1 Young Regional Victorian. A BIG Thank-You to everyone for your extremely generous support. We now have enough to support 1 young Victorian through their selected Regional Leadership Program. Thank-You for you generous donation to supporting future young Victorian Leaders. Your donation will be helping to shape the future. Thank-You for your generous donation. We will add your e-mail address to the Victorian Regional Community Leadership Program "Leaders in Leadership" email list. You will get to read about the great things happening within Regional Victoria. Thank-You for you extremely generous donation! We will send you a personalised Thank-You from the 2016 Scholarship Recipients . 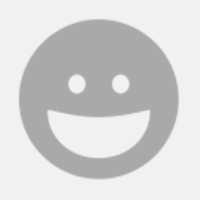 Thank-You for you extremely generous donation! We will send you a personalised Thank-You from the 2016 Scholarship Recipients and you will also receive a letter from the 2017 Scholarship recipient.